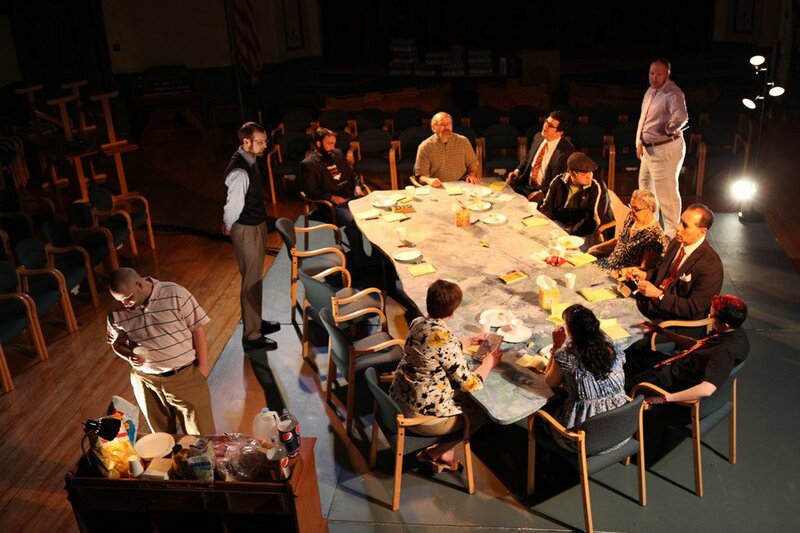 The Theatre Co. of Saugus presented Twelve Angry Jurors during the second weekend of April 2011. Also titled Twelve Angry Men (or Women), this popular courtroom drama by Reginald Rose originated on television in 1954, and has been adapted for the stage by Sherman Sergel. Twelve Angry Jurors is a chilling drama about conflict and humanity and the limits to which people push one another when their instincts and motives are challenged. The play follows a jury through an intense deliberation process as they decide whether or not to convict a young man of murder, a crime in this circumstance to which the death penalty is attached. As time passes, what seemed to be an open and shut case becomes less and less about the fate of the accused and more and more about the people in whose hands it rests. What follows evolves into a disquieting look at how confinement, stress, and the ways in which we naturally ally ourselves in social situations will shape the face of any event. The Theatre Company was pleased to have Eve Summer as the director of this production. The stage manager was Candace Parks, and the producers were Amanda Allen and Lisa Felix. There were four performances of Twelve Angry Jurors: on 7, 8, 9, 10 April 2011. The location was the Saugus Town Hall. Seating was in the round, with the audience on all four sides of the jury table.